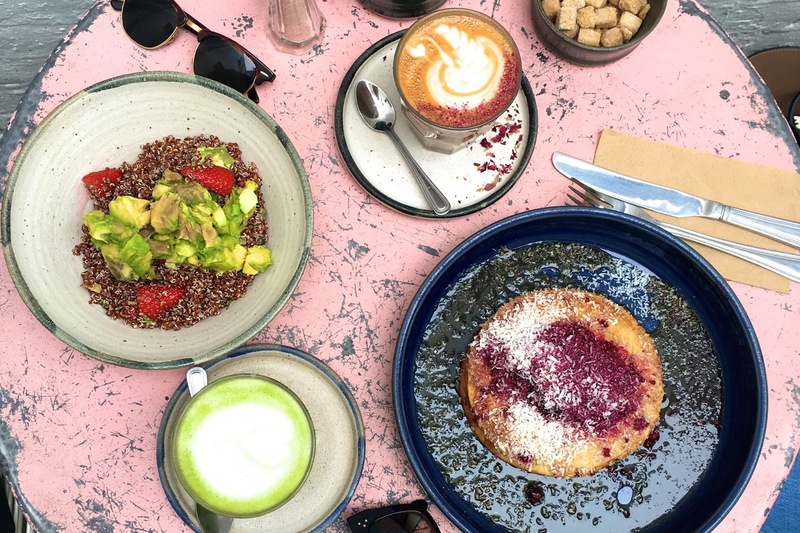 Farm Girl Cafe is a hidden gem, tucked away off Portobello Road in the heart of Notting Hill and offering the perfect respite from the hustle and bustle. This place has the whole Australian laid-back, healthy-living cafe concept down to a tee. Outside is a cute little courtyard with a relaxed, low-key atmosphere, perfect for chilling out with a slab of cake and a Matcha or Rose latte, or stopping for a little longer to grab a full-on hearty luncheon. This place closes pretty early, (around half 4pm) so is definitely a brekkie or lunch destination, but they do it oh so well! The menu has something for everyone and is full of nourishing, wholesome and delicious options, bursting with vibrant colour and lushh goodness! Torn between the savoury and sweet offerings, I ended up opting for the Strawberry Salad, a delish quinoa-based salad with lashings of avocado, and refreshing hints of mint, basil and lemon. I paired this with a Matcha latte for a superfood hit, but the Rose latte is their signature and one I will definitely be returning to try! I was also eying up their avo on toast, and the buckwheat Berry Pancakes looked ah-mazingg... I think it's safe to say I will be visiting this place again soon!